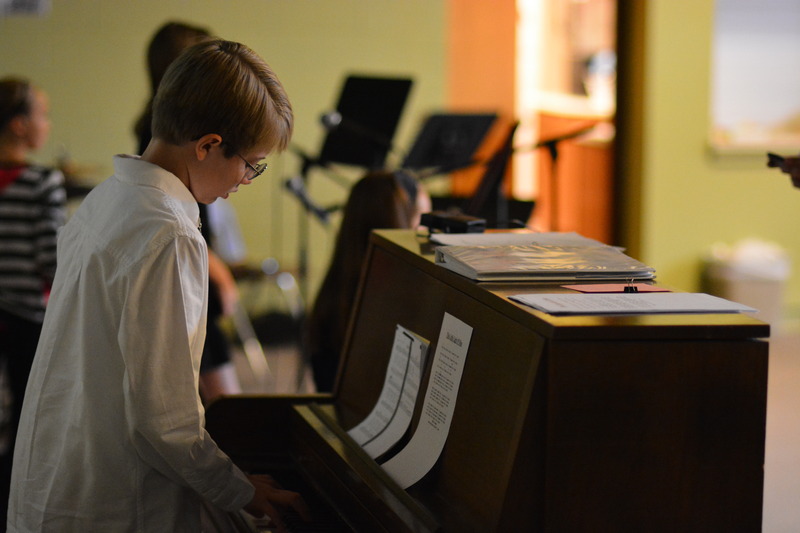 Since I am a pianist it probably won’t surprise you that music is at the foundation of my faith. Just the idea that God takes different vibrations and turns them into pitches–which create a musical language, which expresses emotion–bolsters my faith. Add inspirational text, for example Handel’s Messiah, and suddenly you have a complete miracle. Music is no accident of the universe. Music is one of God’s greatest gifts to us. At the lunch table ten-year-old Mary asked a question from church this morning. What does consecrated mean? It came from the hymn “Take My Life and Let it Be.” Both kids started singing it right there at the table. Many Sunday afternoons I catch my family humming or singing songs from the service. Since I accompany the choir those anthems can stay with me for a very long time. What a high class problem–to get those pesky songs of faith and love stuck in your ear for the whole week! I believe that is the Holy Spirit at work. . . I love all kinds of music–but I’m especially fond of old music. Old music feeds my faith because it anchors me to the faith of the past. When we sing “Great is Thy Faithfulness” I remember that it was my grandfather’s favorite hymn and I think about the legacy of faith that he handed down. One of the last moments I had with my dad was sitting on the edge of his bed and singing through the LBW. After a mild stroke he couldn’t speak, but he could sing that bass part loud and clear. Now, when I hear those hymns I also hear my father’s voice. Music connects faith from generation to generation. At the lake, the Messengers sing “The Spirit Intercedes for Us.” With sighs too deep for words to express. Music is part of that Spirit. Sometimes when things are so tough we don’t know what to say or what to pray–all that is left is to sing. The comfort of familiar melodies and harmonies gets us through to God when words alone fail. When even our faith fails. Once when I was having one of life’s little faith crises I overheard my son, Calvin, at the piano singing “God of Wonders Beyond Our Galaxy.” You are holy. Holy. It brought me back to whole. Back to holy. Sometimes we can sing for ourselves, and sometimes someone else has to sing the song for us for a little while. My prayer is–wherever you are in your faith and whatever is going on in your life–that Easter and Easter’s musicians help sing the song for you a little every week. God bless. This entry was posted in Christian spirituality and tagged Easter Lutheran Church, great is thy faithfulness, hymns, music, prayer, signs too deep for words, worship music. Bookmark the permalink.